Wow, it feels so nice to be able to write a positive review of Justice League. I admit I cringed when I saw the cover of this issue, the band proclaiming that this is the beginning of a six part story. I was prepared for another slog, like the previous tale. But nope, Hitch is in high gear with this one. 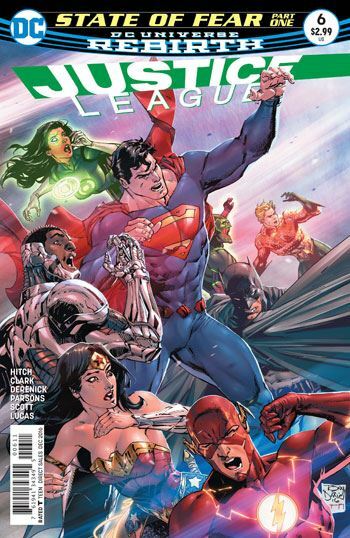 The story begins with the Justice League en masse fighting and defeating some shadowy creatures. Even though they triumph, none of the League members are entirely certain what they were fighting against. For quite a while it seems as if this issue is going to explore the personal lives of the members. The fact that the Flash and Green Lantern (Jessica, not Simon) agree to go out on a date together seems to back that up. But Hitch takes a different twist with the story. Although the League believed that they had dispensed with the shadowy creatures, in fact it appears that they were infected by them. We see a number of members display erratic behaviours, all derived from fear. Superman, Batman, Flash and Green Lantern (Jessica) all wind up acting uncharacteristically because of this infection. And credit goes to Hitch for exploring how the fears of the various people would manifest. It’s not a case of everyone acting exactly the same way. The implication is that the other Green Lantern, as well as Wonder Woman, Cyborg and Aquaman, are also experiencing the same problems. Are they? I suppose we will find out next issue. I am hoping that at least one of them proves immune to the effect, and is able to figure out what is going on with the rest of the team. The shadowy beings that the League battles at the top of this issue bear some slight resemblance to the Anti-Monitor’s shadow demons. Although that might simply be because they are basically shapeless, and black in colour, so there is little to define them. But Rebirth is tugging away at my brain just enough to be looking for a connection.